LONDON - Samantha Cameron joined her husband, Tory leader David Cameron, on the election trail over Easter, captured in her debut Sam Webcameron online video. As the parties prepare for a month of campaigning in the run up to the next General Election, officially called for 6 May, the Conservative leader's wife launched Sam webcameron as part of a campaign strategy to attract young female voters. 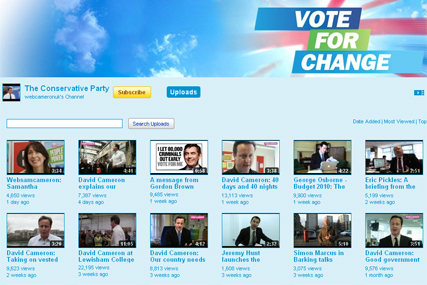 The YouTube video channel, renamed from webcameron, shows Samantha and David visiting an inner-city youth club, talking to members and volunteers of a Hackney group. The video is likely to be the first of many digital strategies the Conservatives adopt as they look to succeed Labour as the party in power. Last week the Tories used Match.com to place digital ads, championing their pledge to reverse Labour's plans to increase National Insurance, in front of people in the exact salary band their pledge affects. Earlier this morning David Cameron welcomed the official announcement of the General Election date and told voters it was a choice between five more years of Gordon Brown's tired government making things worse, or change with the Conservatives who, he said, had the energy, leadership and values to get Britain moving again. Brown officially launched the General Election campaign this morning outside Downing Street, signing off with the words "Let's go to it". Brand Republic is bringing together its political campaign coverage on the new Red, yellow and blue blog.